THE NATIONAL Road Safety Commission (NRSC) has officially launched the fifth edition of its National Road Safety Awards (NRSA) to reward transport operators, journalists and other road users. 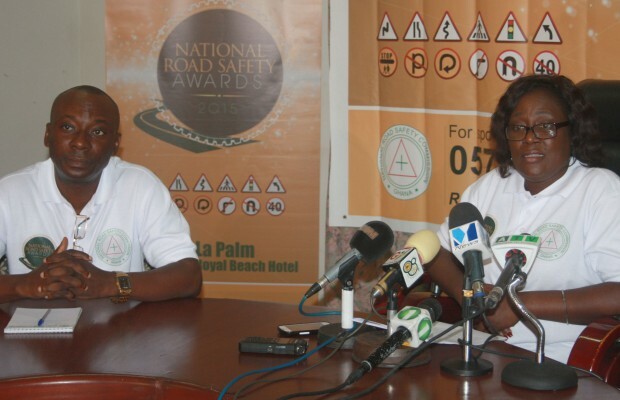 According to Ing May Obiri-Yeboah, Executive Director for (NRSC), the event which is slated for November 13 at the La Palm Royal Beach Hotel, has been repackaged to respond to emerging trends and also to whip the campaign on the need for road safety environment. The main purpose of the event, she told journalists in Accra on Tuesday, is to get operators to understand and exercise safety policies and standards in their operations for a reward or recognition. “Road traffic crashes are responsible for an average of 2,000 deaths a year. Almost 60 percent of crash victims are within the productive bracket of 18-55 years. This situation impacts us negatively. The sad reality is that these crashes are avoidable if we apply some diligence to hire the right driver with the right attitude and training. This and many other reasons justify the need for the Road Safety Awards,” Ing Obiri-Yeboah stated. The award event which was instituted in 2010 has nine categories ranging from the Best Road Safety-Oriented, Best Driver Award, Best Road Safety Journalist Award and Best Commercial Passenger Transport Organisation, among others. She urged journalists in the print, radio and TV categories to submit their stories on road safety published in the local or international media between August 15, 2014 and August 15 this year to win in the Best Road Safety Journalist Award category. “It is our expectation that the media will continue to demand accountability from all of us stakeholders in road safety management. Since, the introduction of the award, media reportage on road safety has seen improvement in the frequency and content. Journalists are getting interested in road safety accountability stories and that is encouraging,” the NRSC boss said. This year, the awards committee is collaborating with Origin8, an integrated marketing communications agency, to organise the event and help project the outcome for significant impact.